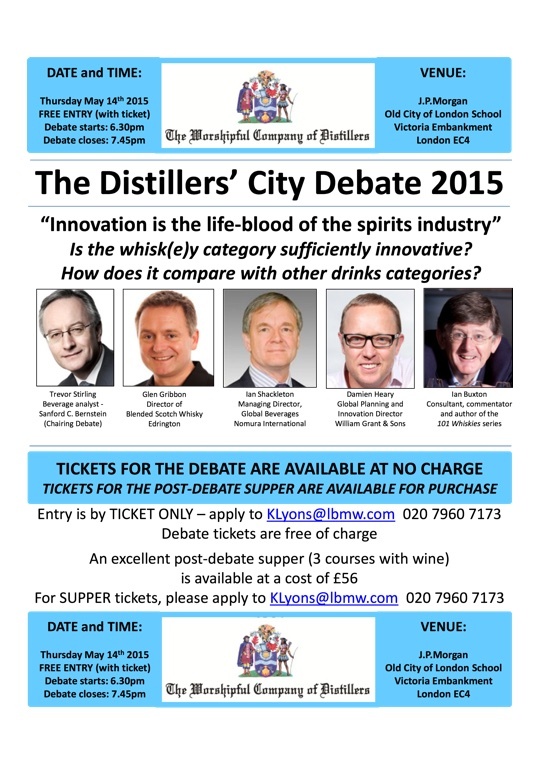 The Distillers’ Livery Company will ask this of a panel drawn from companies with a reputation for innovation, city analysts and with agent-provocateur Ian Buxton thrown in for good measure – at its annual City Debate on 14 May. But the industry has discovered a vast market of new potential consumers looking for excitement, prestige, value, and even flavours, never previously dreamt of. Damien Heary, director for innovation and planning at William Grant & Sons, winner of Whisky Magazine’s Innovation Trophy for the last two years and Glen Gribbon, director- blends at Edrington can be expected to highlight moves to tap this market, while spirits writer Ian Buxton, who sometimes treads where others fear to tread, and beverage analyst Ian Shackleton, MD of Nomura International, who checks the shekels before anything else, will ask whether they are as innovative and effective as they think. Heary and Gribbon can be expected to point to the focus on the global travel retail sector, where much of the innovation begins, often at very prestigious prices, range explosion which encourages consumers to discover new lines, replacing age statements with exotic names to escape the comparative ladder of age as the sole measure of value, and limited editions appealing to the growing market of collectors. And to grain whisky, once perceived as the least exciting part of the portfolio which now commands a premium. And perhaps to technical advances which have improved consistency and reduced cost – a vital step in a product which has to be matured for so much longer than its white competitors. The Worshipful Company of Distillers, established by Royal Charter in 1638 to regulate the industry now provides it with a forum to discuss topical issues.